ZooLights (3001 Connecticut Ave. NW) -- Visit the Smithsonian National Zoo for a holiday extravaganza. Enjoy winter treats, live musical performances, and 500,000 environmentally-friendly LED lights that brighten the Zoo. Through Jan. 1; 5-9 p.m.; admission is free. Washington D.C. Temple Festival of Lights (9900 Stoneybrook Drive, Kensington): The Mormon temple grounds are illuminated by 600,000 lights, and when you want to get out of the cold, duck into the indoor theater for nightly performances that vary from bells to choirs to swing music and more. (Free tickets are available 90 minutes before each performance.) You'll also find Christmas trees decorated in international themes, an exhibit of crèches from around the world, and a life-sized outdoor nativity. Through Jan. 1; most performances 6, 7 and/or 8 p.m. nightliy. Winter Lights Festival (1950 Clopper Road, Gaithersburg) -- Drive through 3.5 miles of 365 illuminated displays and 65 animated vignettes at Seneca Creek State Park. Through Dec. 31; Mon.-Thurs. : $12; Fri.-Sun. $15. Hours: Sun.-Thurs. 6-9 p.m.; Fri.-Sat. 6-10 p.m. Lights on the Bay (1100 E College Parkway, Annapolis) -- Grab your friends and head out to Anne Arundel Medical Center's 20th annual holiday light show, Lights on the Bay. Enjoy a two-mile scenic drive along the Chesapeake Bay with 70 animated and stationary displays lighting the roadway. Through Jan. 1; 5-10 p.m. nightly, including holidays. Festival of Lights (301 Watkins Park Drive, Upper Marlboro) -- Drive through this holiday display featuring more than one million lights. Through Jan. 1; check site for pricing information. Bike the Lights (Symphony Woods, Columbia) -- On Dec. 15, you can take spin a around Howard County's Symphony of Lights. Bicyclists can take a 1.4-mile ride while watching the illuminated light displays, featuring more than 70 animations and 250,000 bulbs. Admission is $10 in advance; $12 at the door; children under 10 are free. Dec. 15; 4-5:45 p.m.
Annmarie Garden in Lights (13480 Dowell Road, Dowell) -- Take a walk through the magical woods, where light sculptures of mythical beasts, pirates, circus performers and more will surround you on your journey. Through Jan. 3; 6-9 p.m.; admission $7 for ages 5 and up. Bull Run Festival of Lights (7700 Bull Run Drive, Centreville) -- Visit Santa's Enchanted Lights in the Holiday Village, and watch 40,000 lights dance to the season's holiday tunes. Through Jan. 4; Mon.-Thurs. 5:30-9:30 p.m.; Fri.-Sun. 5:30-10 p.m. Check site for varying ticket prices. 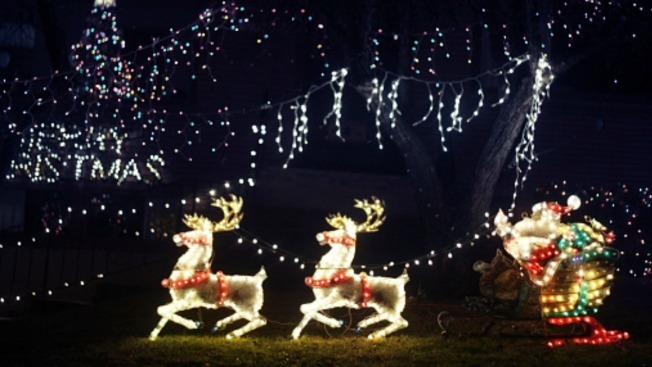 Winter Walk of Lights (9750 Meadowlark Gardens Court, Vienna) -- Now through Jan. 4, take a half-mile walking tour of lights with animated displays. You may run into Flurry the Snowman and Molasses the Gingerbread Man on the trail! Click here for more information on special events in December. Through Jan. 4; 5:30-10 p.m.; $6-$13.